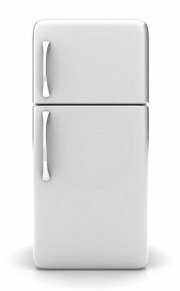 Do you need to leave a fridge or freezer to stand before plugging it in after it’s been delivered (or after moving house)? Yes, but it’s not possible to quote a definitive period of time it should be left for. This article explains why you shouldn’t plug it in without leaving it to stand, and advises on how long to leave it. Why is leaving a fridge or freezer to stand necessary? After being transported, unless it’s been kept totally upright, the oil inside the compressor may leak into the refrigeration system. This oil needs to slowly settle back into the compressor. If the compressor is switched on before it’s settled it could be pumped around the refrigeration system and cause a breakdown due to a system blockage. How long should it be left before plugging in? Advice from different manufacturers varies considerably so check your instruction manual. In my Neff fridge’s instruction book it advises only, “at least half an hour”, which is surprisingly low. A Smeg fridge freezer instruction book says, “let it settle for 6 hours”. This 6 hour recommendation is increased to 24 hours if it is known that the appliance has been laid down. In an AEG integrated freezer instruction manual it says to leave it at least 4 hours before plugging in. Check to see what the instruction book says and take the advice of removal or delivery men. If you have transported the appliance yourself and know it has not been laid down it can be left for a shorter period, but I’d still give it several hours at least or ideally 12. At the end of the day, the last thing you want is a system blockage. If you had to temporarily tip the appliance over to get it through a door or off a vehicle then you need to let it stand for longer than if it was kept upright constantly. If you know it’s been laid down leave it for 24 hours. If the appliance has been delivered to you they should advise a standing time period though chances are they’ll be instructed to advise a really long time to make absolutely sure. It may be over long, but as you cannot know if it’s been laid down you shouldn’t take a chance. Any system blockage directly after delivery will not be covered on the guarantee. Support this free resource by using my affiliates. They provide quality, related services and goods.